Quote from Mafia Hallo, this is your favourite I mean friendly neighborhood Mafia. ;D Always pleased to make your acquaintance! I don't have time for 'Hi' or similar messages, just tell me directly and don't waste either of our time. I also don't lend out Pokemon, you're welcome to check out my trade/sale box though. Alright, I tallied the participants of #ohnohooh now, thanks to all the 46 users that participated! 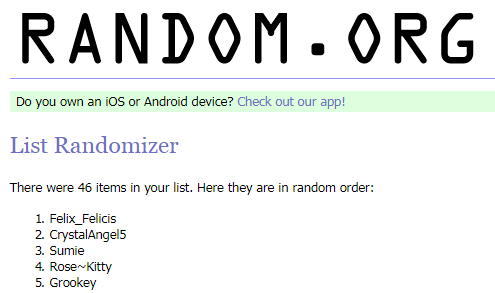 I used random.org to randomize the list, and the winner of the Ho-Oh is Felix_Felicis, congrats! I'll send you a private trade shortly. HOWEVER, since I was so incredulous to have drawn like the one person I knew most out of all the participants, I decided I'm going to dig through my item bag and send places 2-5 from the randomized list a little something as well. By PokéRadar - 2 Minutes and 42 Seconds ago. Congratulations! A shiny Unown C hatched out of one of your eggs (Chain #194)! Your PokéRadar reset and needs new batteries. 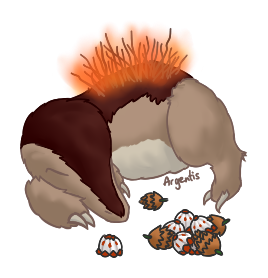 I'm back online, and look at the fantastic avatar art Katakuri did of my Jolteon Jaari. <3 I'm currently working on the art of Jaari's trainer, after I'm done with that I'll make Jaari's TH profile (with a bit of lore) public again. I'm super excited for this. I guess I could try doing that honest opinion thingy too, if anybody's interested. Always exchanging for these at equal DP. Mafia is currently hunting Bonsly.